First Posted Online: December 30, 1996. Reposted: April 06, 2006. Well, that just makes the pain all the more exquisite, doesn’t it? In 1996, we were no longer in Dragon; but HOB was starting in d8 magazine, and by 1997, Yamara spinoffs would appear in both Shadis and Troll magazines. But while we crept forward with our plan to appear in all remaining RPG periodicals, another avenue was opening for those who didn’t mind not getting paid for drawing comics. and this amusing strip he was publishing online called Sluggy Freelance, and suggested that that might be a way to go with Yamara. We were seriously considering it. Vinny Salzillo of Double Exposure, having witnessed our initial bumping from the October 1995 issue over the phone while we were at his convention, magnanimously offered us space on his site at io.com. Our main enemies were, of course, time and money. Weeks stretched into months. Feeling pressured by the new venue for comics, and realizing he hadn’t drawn Yamara all year, Chris wanted to put together a quick strip over the holiday season. Infiniti’s new obfuscative ad series, again starring Jonathan Pryce, came to our rescue, and the above episode is the result, posting just before New Year’s Eve, 1996. …Chris didn’t have the speed for a daily, we doubted the wisdom of webcomics in an era of crappy baud rates, and we still liked the idea of being paid. So from 1996 – 1998, we sought out dead tree venues and the dead tree checks that came with them. Of course, we weren’t in Dragon for lack of trying. 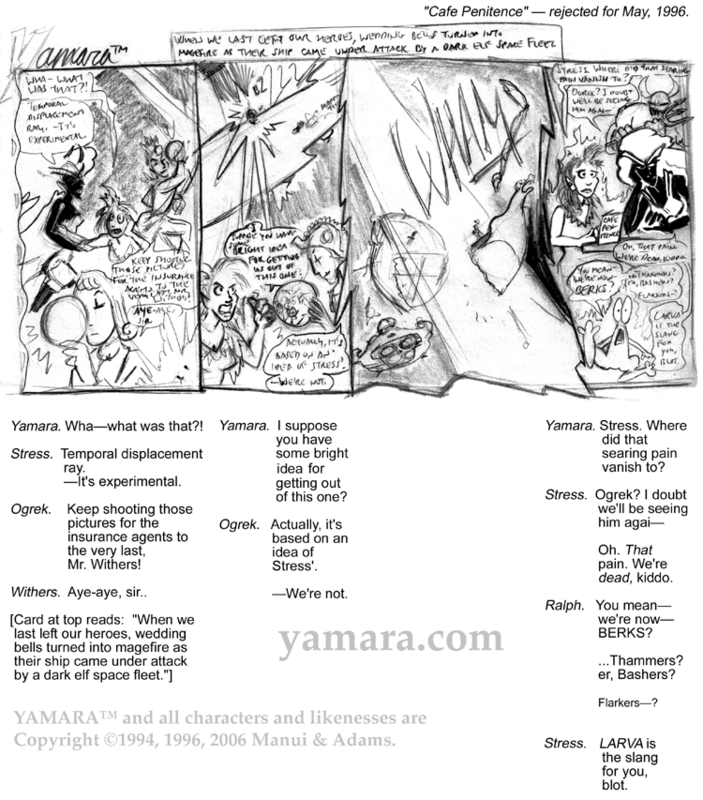 In an attempt to reach a compromise, and continue the strip, we offered, early in 1996, to return Yamara to its four-panel roots; in theory this would allow it to fit onto different pages, and what-not, and not cost TSR, now struggling with competition from Wizards of the Coast, as much in artist fees. We had a good deal of dead character jokes and Planescape malarkey building up, including some sketched out scenes of Stress, Yamara & Ralph’s “return” to the living… but some of that we might still use. Heh heh. The above strip, of course, has been superseded by the online cliffhanger resolution, and so it stands as the final “Lost Episode”, rejected by TSR sometime in February or March of 1996. As a last note, starting Monday, we’ll be spending the next two weeks reformatting the four online pages from 1997, here into the main “Hundred Classic” battery.